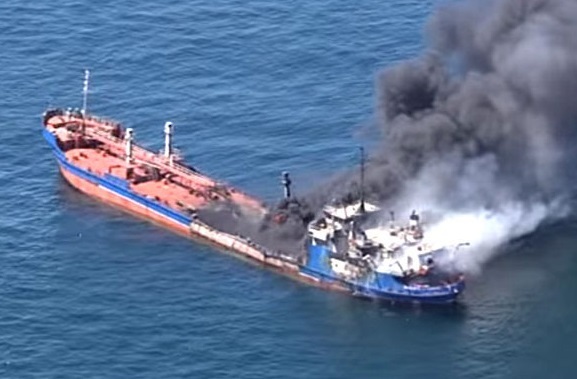 The tanker Palflot-2 caught fire in Caspian sea. The fire started in the vessel’s superstructure and caused explosion. After the accident 1 seamen died and another 18 abandoned the ship into a liferaft. Later all the people were rescued by nearby Russian cargo vessel, but tanker Palflot-2 continue to be in flamed and followed by more explosions. The rescued seamen were in good health and without serious injuries. During the accident the vessel was in Turkmenistan waters en route to Turkmenbashi port under ballast. The local authorities did not reported about water pollution. At the scene of the accident were dispatched several boats of Azerbaijan salvage and coast guard, who assisted with firefighting and succeeded to extinguish the flames. Currently the vessel is under tow to Baku, where will be held and investigation about the root cause of the accident. It is not yet clear what caused the fire. The tanker Palflot-2 (IMO: 8952247) has overall length of 108.00 m, moulded beam of 15.00 m and maximumd raft is 3.00 m. The deadweight of the ship is 2,858 DWT and the gross tonnage is 2,015 GRT. The vessel was built in 1982 by Rousse Shipyard in Bulgaria and managed by Russian company Astrakhan Shipping Services.